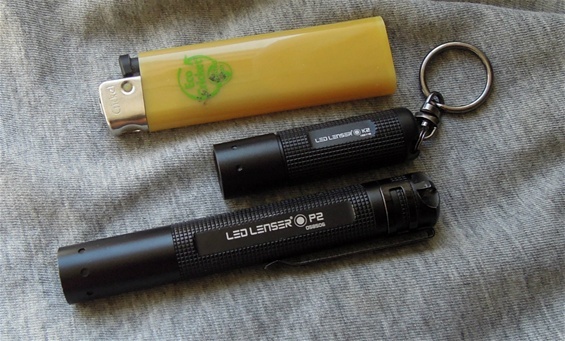 Just got this today and it is a Led Lenser K2. This got a completely different LED/reflector system than the P2 that I have used for many years. The K2 is micro small and it got a surprisingly good output. In the different articles and pages you can find some talk about the small lights and how useful they are. The construction seems to be tight and proper done. It does not rattle inside the construction and the threads are tight and smooth. This is important because it prevents it from turning on by itself or disassemble. The turing on and off by the head is easy and there is some turning place so it is not to narrow. This is important because if to close to the "on" area may result it to contact/light and use batteries unnecessarily. This you can have in mind when turning the head. Some people only want minimalistic carry and this is interesting and it does work for them. I prefer a SAK with functions on. 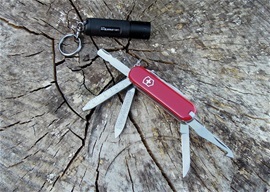 The Victorinox MiniChamp models are interesting. My model is the 0.6385 with a pen hidden in the scale and this is really a nice feature. I know that these models are made with the philosophy of miniaturization and they are not easy to make. 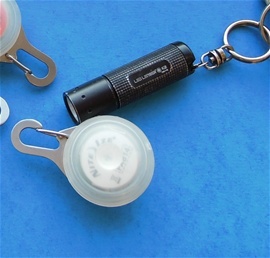 It is interesting because it really takes very little space and do fit very well on a key-ring or key-chain. 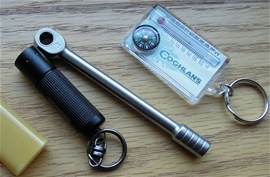 It is very easy to dismiss it as a use tool because of the little size. All functions are made for use and the precision is very well. We can see the last years of the Victorinox development that the 58mm category is a hot topic. In my milestones i have researched much on the development on the 58mm category. 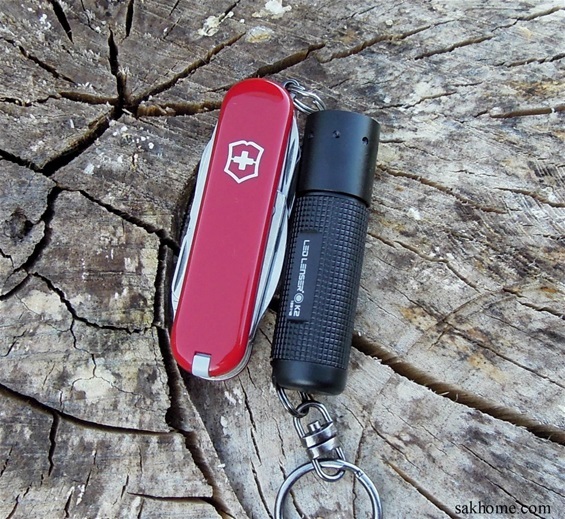 Miniaturization and minimalistic carry does work for many! The Ratchet is a very high quality tool made by Victorinox. It is tested very well and it is in full order. Miniaturization will always be important because in many situations it is not possible to have larger tools or weight. To make miniature tools work and perform well is a science and require the best of modern production. 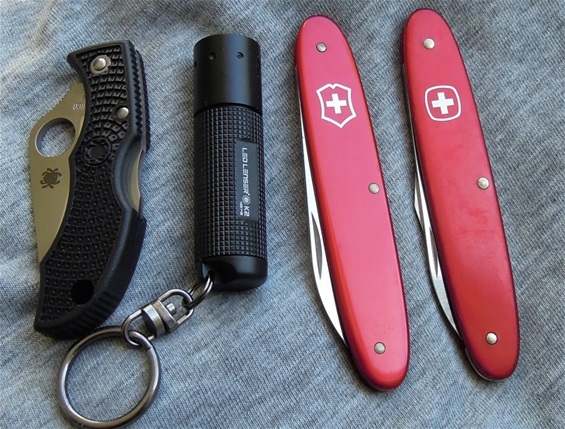 Miniature knives and functions can in some cases outperform larger SAK when using it on electronics or devices. 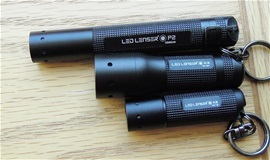 I have always enjoyed the LED Lenser Brand! 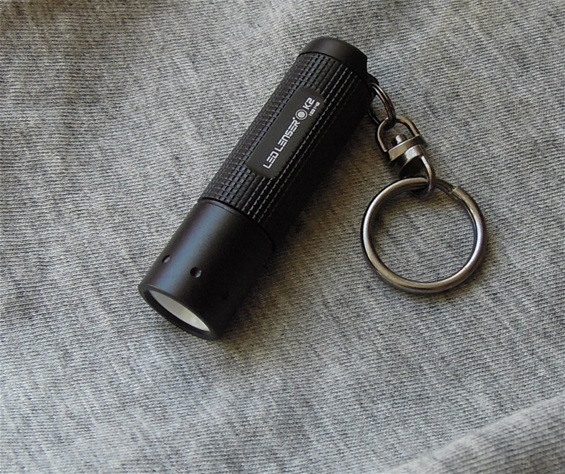 The LED lenser K2 has been on my keychain for many months. This is a quality product it still got the original batteries. This little light did help for the small things it is intended for. Just a little helpful tool for the every day tasks. The black color and anodizing got many scratches because its been on my keychain/ring with the keys every day for many months. On this picture you can see the black anodized surface got scratches and wear. This is unavoidable and even with the harder anodizing or different methods it may be too difficult to avoid. 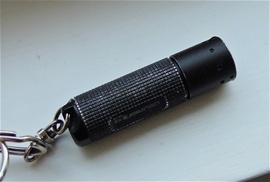 The light is in full order and the small swivel/chain and ring is intact. Quality product yes! This light has been with me in my kayak fishing and it’s been fully soaked or wet a few times. It has also been with me in rain, snow and light cold. I have used it as a spare light and for hobby use as well. I need a small light very often when I research tang stamps or postage stamps. I checked the batteries and there is not corrosion or any negative happening inside it. The only negative detail is the back lid plated contact is detached inside as usual but there is a small opening through the lid that makes sure the contact is attached secure and the hole is sealed with a glue or material inside. Maybe it cannot be called negative but I am not 100% convinced about this. It seems to me that the result of this construction is that the nob is too long and prevents the back lid to get fully tightened. It is very minimal and it may be a minor thing. Anyhow the inside of the body is clean! The rubber seal on the threads has done its job well. No water has come through any place. I took notice of the construction and the on off switch when I got it. To turn the light on one must turn the front head in. When switching off the light one must not turn so far that the construction is open and water or moist could get inside it. It is unavoidable sometimes not to do this but the rubber seal and construction is clean inside. There are only small fragments of dust on the threads. Luckily the head is a bit hard to turn and therefor it is not turning on or off when it rubs against the keys. 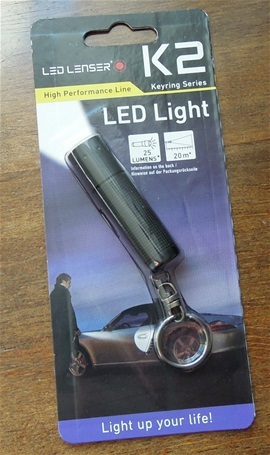 This Led Lenser product is a low cost one and it is quality made. It may be that the nob i mentioned is there to put pressure on the construction hence avoiding it to turn loose. I am not sure completely. It is the only minor negative detail i can find at all.